Classic inspired Power Metal by VAN CANTO Mastermind Stefan Schmidt, feat. Jörg Michael, Daniel Wicke, Sebastian Scharf and some of the greatest classic composers. 2018-02-16 OPUS II - THE ANNIHILATION is out now! Today is the day! Our 2nd album is released! Check out the first official clip of our 2nd album. This is „None shall sleep“. 2017-11-24 OPUS II - The Annihilation. New album out in February! We are back! We will release our second opus „The Annihilation“ on February 16th 2018 via earMusic! 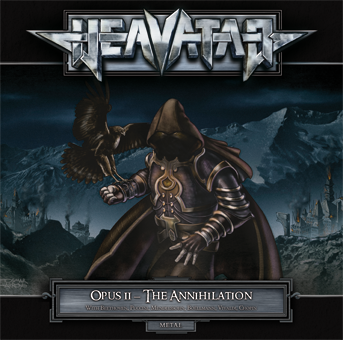 CLASSICAL INSPIRED METAL-FUSION HEAVATAR TO RELEASE NEW ALBUM “OPUS II – THE ANNIHILATION” ON FEBRUARY 16th, 2017 ON earMUSIC. “Opus II – The Annihilation” is going to be released on February 16th, 2018 on earMUSIC as CD and Digital. Daniel Wicke is the new bass player of HEAVATAR.